The Kia Forte is the automotive brand’s compact car that has been produced and sold in the United States since 2010. The Forte is currently in it’s second generation, having received an overhaul back in 2012. The Kia Forte is unique to the automotive market, in that it is offered in three different body styles: 2-door coupe, 4-door sedan, or 5-door hatchback. The variations of the Forte make it a truly customizable compact sedan, that can easily fit into any lifestyle. The Kia Forte was designed with the younger driver in mind, featuring a fun experience behind-the-wheel, a sharp exterior design, and a budget-friendly price tag. The 2015 Kia Forte received more changes from the previous model year, and truly stands out amongst its toughest competitors. The Forte5 Hatchback and the Forte Koup are great alternatives to the traditional sedan styling, and offer excellent value. 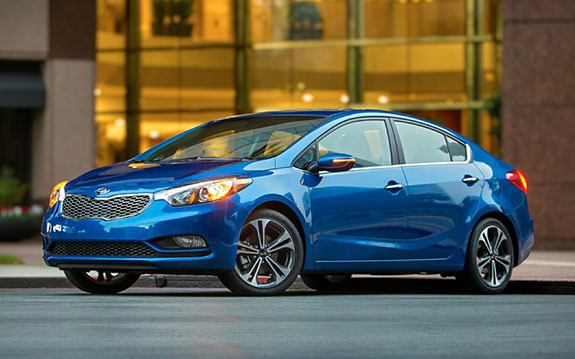 The 2015 Kia Forte comes in one of two trim levels, which takes the customization of the Forte one step further. The Honda Civic has long been perceived to be the Kia Forte’s toughest competitor. While the Civic has been around for a longer period of time, the Forte truly measures up to every expectation of the compact car buyer. Why exactly does the 2015 Kia Forte have the upper hand on the 2015 Honda Civic? We are glad you asked. Price - The Kia Forte’s starting MSRP of $15,587 beats out the Civic’s $17,193 price tag by nearly $2,000. That’s a lot of extra gas money. Fuel Economy -The Civic may have the Forte beat in the city MPG department, but the 2015 Forte makes up for it with an EPA-estimated highway MPG of 37. The Civic lags behind with only 36, which in the long run can really add up. Space - Hands down, the Kia Forte has more room than the 2015 Honda Civic. Aside from the larger overall exterior and interior dimensions, the Forte packs in 14.9 cubic feet of cargo, while the Civic can’t fit more than 12.5 cubic feet of cargo in its trunk. Safety - When it comes to one of the most important aspects to consider, the Civic and Forte are neck in neck, with the same overall crash test rating of 5 stars. Choosing to purchase a 2015 Honda Civic based solely on its name recognition can be an easy trap to fall into. The price, efficiency, space, and safety of the Kia Forte speaks volumes for where it stands in its class segment. Purchasing a new sedan should be done on more merit than a brand that has been around for a while. The Kia Forte is proving itself in the automotive world, and has become quite the contender against the 2015 Honda Civic. A traditional sedan body styling isn’t always the right fit for every driver. Kia recognizes this fact, and has designed a Forte to fit the needs of every driver. The hatchback is a great option for the type of person who craves adventure, and is always on the move. The extra vertical trunk space is a great bonus to the hatchback version of the Forte, which also adds to the overall passenger volume that is greater than the sedan or Koup variations. The Forte5 Hatchback not only features the most passenger volume, but it also outdoes the Forte Koup when it comes to cargo capacity. The Forte5 can hold up to 23.2 cubic feet of cargo, while the Forte Koup comes in at only 13.3 cubic feet. Thanks to the hatchback raising the roofline of the compact car, the Forte5 also offers the most head room. The Forte5 comes standard with an automatic transmission, while the Koup comes standard with manual. The interior features of both the Koup and Forte5 are the same, offering the level of standard upgrades that Kia drivers have come to expect. The Kia Forte5 Hatchback comes standard with a rear window wiper, while the option is not available on the other Forte models. The Forte5 comes in above the Koup in efficiency, with a combined fuel economy of 28, while the Koup gets a still-impressive 27 mpg combined. Both the Forte5 hatchback and Forte Koup offer unique options for drivers who seek to exist outside of the realm of everyday normalcy in the automotive world. The Forte5 offers a fun, sporty ride, perfect for the adventurer with an eye on efficiency. The Forte Koup is a good option for those who want something different from the traditional sedan styling, but who find themselves attracted to all of the features that the Forte offers. Whatever styling, each 2015 Kia Forte model offers a high-quality vehicle that doesn’t cut corners. Deciding on a body style isn’t the only decision Kia Forte buyers have to make - they must also consider which trim level is the right fit. 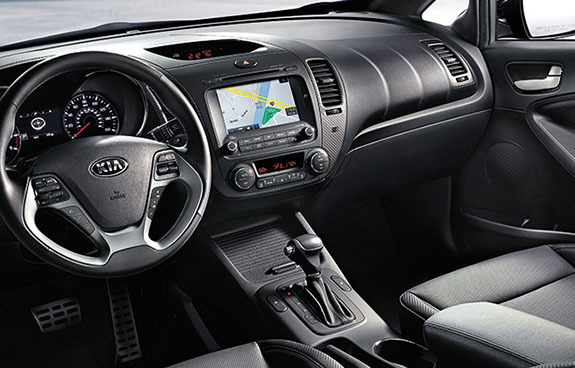 Kia offers the entry-level LX trim level, as well as the Power and Features EX option. Both offer great standard features at an excellent price point, with the EX trim providing that extra boost of luxury convenience car buyers are looking for. Starting at just $15,890, this entry-level trim option has an impressive combined fuel economy rating of 30 mpg. Advanced safety features are standard on the LX as well as the EX, which means that safety will never have to be sacrificed. The exterior of the LX shines with standard tinted glass, power adjustable rearview mirrors, and power heated exterior mirrors. The interior is impressively equipped with standard satellite radio, a 4-speaker system, steering wheel controls, and lower console storage. This version of the 2015 Forte is a great option for those budget-minded individuals who want some of the updated features, without all of the bells and whistles. With a starting MSRP of $19,390, this higher-end trim level features excellent interior features like a standard leather-wrapped steering wheel, remote keyless entry, and a navigation system. The six speaker sound system that comes standard will keep your tunes sounding great at any speed. The dual illuminated vanity mirrors and overhead console storage keeps your need for convenience a priority. The 2.0 liter 4-cylinder standard automatic engine is an upgrade from the 1.8 liter manual that the LX offers. With nearly a $4,000 difference in price between the LX and EX, choosing between the two is a matter of preference. Each trim level comes with its own advantages, but no matter what you may choose, the biggest advantage will be owning a 2015 Kia Forte sedan.